If you can't think of anything intelligent to say, just smile enigmatically and make people wonder. What was she thinking, do you suppose? Personally, I believe it's something along the lines of, Damn it, Da Vinci, can you hurry the f*** up? I have to pee! Do ever project? And for the writers among you, do your characters ever project their own feelings, biases, etc., on other characters in your book? I think (there I go thinking again!) the extent to which a character does or doesn't tend to project is one more tool a writer can use to add dimension to characterization. i like your projection of mona lisa's thoughts. i can honestly say i've never thought about it, but now that i have, i like her with your thoughts. she's much more human. Projecting... I know it's almost lunchtime, but my brain still isn't awake enough to think. Okay, crawling back in my brain cave again. Happy Monday! 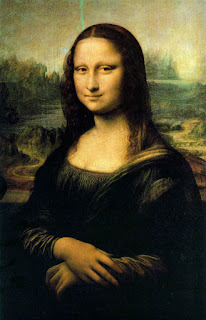 To me, the Mona Lisa always looks kinda smug and evil. Like she put super glue in Leonardo's tighty whiteys, and she's waiting to see what happens when he steps away from the easel and tries to sit down. But maybe that's just me projecting. Anybody seen my super glue? Perhaps Mona was a writer at heart, and she'd just conceived of a particularly clever line of dialogue for one of her characters. If I'm in a faculty meeting at work and have an enigmatic smile on my face, I am almost certainly composing in my head. I project onto people, pets, aquarium fish, trees, you name it. Some of my characters do it a little, but not a lot. I think she had the hots for him. Look at her! She's saying, "Come hither, Leo!" I was just in a meeting, being trained on some new tech, when I suddenly realized EXACTLY what would make my MC behave "out of character" in a certain romantic situation. That is, what would make a very practical girl fall for someone unexpected. I don't think I project my thoughts onto my characters, but I have noticed they all tend to like the same food as me. Maybe she was thinking there were enough flamboyant & theatrical people in the world already. Well, it's either "I've got to pee," or "I'm due in April." I have a few characters who project, usually incorrectly. You're right. It is a great tool. On your mark...get set...PANIC SHOP!! Privacy, Schmivacy...this is the Internet!